After learning how humans become contaminated , the laws of “tumah”, this week we learn how a contaminated person attains the purified state. When it becomes apparent the contamination has subsided, the individual was once again examined by the Kohen, who determined if the recovery has been completed. What then ensued were cleansing ceremonies which took place over an eight day period. The Kohen offered sacrifices, and the former “Metzorah” was reinstated as a member of the Community. In the fifth verse that we read this morning, it states “and the priest shall command to kill one of the birds in an earthen vessel” and it continues, “over running water”, mayim chayim. We have read of many immersions, why does the Torah specifically mention, in this case, that running water is required? 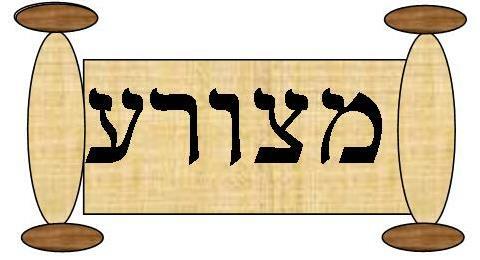 Mayim Chayim, running water, is literally translated as “living water”. The leper had, for obvious reasons, a very low opinion of himself, shunned and ostracized in his community. There was a very real fear that he might become despondent, and very possibly take his own life. It is for this reason that “living water” was required to refresh and revive him. “Sichot Tzaddikim” states that he could only be refreshed, strengthed, and revived by the water of knowledge from the wellsprings of the Torah, which is called “living water”. The laws of Tza’raat apply equally to clothes and garments. A garment may be burnt, and a house boarded up for seven days if they display signs of this contamination. If the signs of Tza’raat remain on the walls of the house, the whole building must be demolished. The parshah also deals with the fact that those men and women who are ritually impure , for whatever reason, are forbidden to enter the Sanctuary, or touch sacred articles. The impure state can only end with the purification ceremony. One might ask, why must an individual go to the Kohen to determine his/her condition when they find white spots on their skin. The answer lies with the fact that people are NOT the best objective judge of their own character. Therefore, one might consider the few white spots as insignificant, and ignore the fact that they are afflicted. The Kohen, on the other hand, with his training and experience, can clearly see that they are signs of Tza’raat. We therefore learn the lesson that before one can properly judge himself/herself, they should solicit an unbiased opinion from others. As the holiday of Pesach draws near, I would like to wish everyone a Chag Kasher Vesameach, and a good Yom Tov!